add a few dashes cayenne or red pepper flakes for heat! Last step: thin out to desired thickness with PLAIN soy milk, soy creamer or water. 1. Bake your sweet potato – if using that method. 2. Add all ingredients to a blender or food processor. I used my Vitamix. Blend on low and increase gradually until mixture becomes smooth. 3. You can do a taste test and adjust spices, sweetness. Lastly, thin out the sauce to your desired thickness using soy milk, soy creamer or water. I added in a splash of soy creamer. 4. If serving with pasta, add directly to hot, just drained pasta and the pasta will heat the sauce. Otherwise, you can simmer the sauce on your stove top until ready to be served or used in a recipe. Simmering the sauce is great if using for a cheesy dip or fondue. 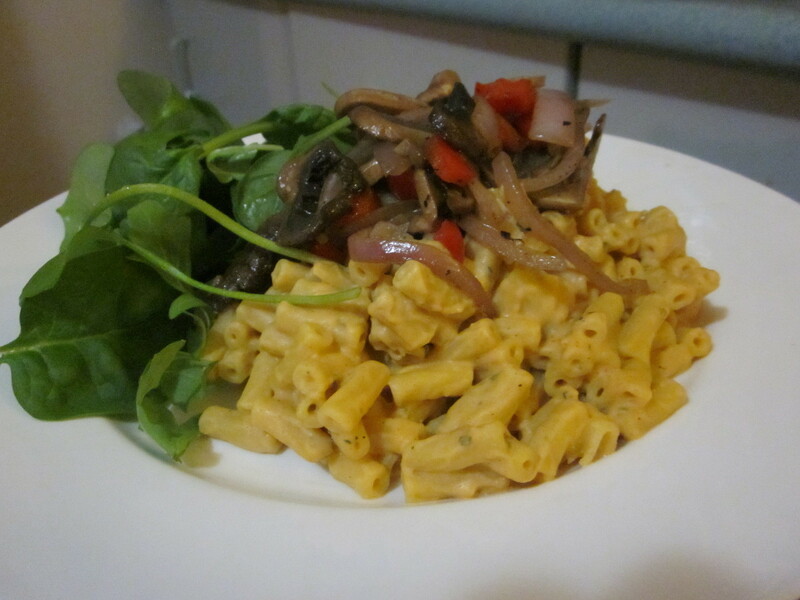 I served it with a topping of fried onion, mushroom and capsicum, plus some leafy greens on the side. I’m looking forward to some leftovers for lunch today too! I haven’t had mac n cheese in 5+ years and I miss it so much. I’ve ordered some nutritional yeast which should be coming soon. Can’t wait to make some of my own! Thanks for the awesome recipe.